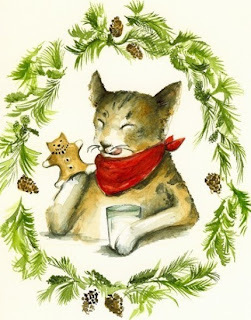 I'm in love with these holiday cards by Amber Alexander. This is not my year to send out holiday cards but if I could I would be sending each of you one of these little treasures. So, pretend you got one from Kat and Dan. I'm wishing you all a lovely holiday season full of gingerbread, sweet treats and family outings. Why is it not your year to send out cards? How do you get away with that? I'm living on a students budget and I'm not happy about it. I have big plans to play Christmas card catch up next year. My problem is, my tastes are too expensive. I can't afford myself. Boo. Hoo. HOo. It's so hard to be me. Is that a good enough excuse. Maybe I'll have to send you one special so I don't feel like a jerk. FYI, I'm going to be super sad if I don't get a new photo of your little ones to put on my bulliten board. How's that for fairness. Awww, come on. You all know that I say I'm not going to do something and then Christmas get's closer and I turn into Miss Christmas. Maybe I will make cards and my cards will be cuter than that little kitty with the milk. So there. Thanks for the card! Did Dan tell you we got our tickets to WA?